Branding Strategy – Our agency sent a strategic team to New York City to learn and understand key details and selling points of this unique college located between Tribeca and SoHo. 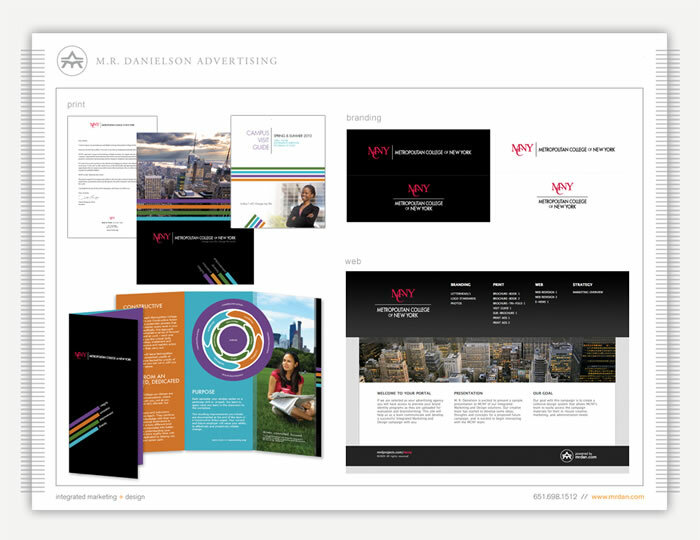 The creative director Michael Danielson initiated a comprehensive communication package that positioned this college with his famous integrated marketing & design solutions. As one of the countries premier integrated firms, MCNY selected an agency that can encircle and deliver a complete advertising campaign from one resource. We offered them a fresh new brand that included print, web, social, broadcast and analytics. Web Site Design – Our team designed, programmed and produced a web site that presents Metropolitan College of New York as a premier education center offering a wide array of classes to students and adults in NYC. The college has two locations, the the main campus in lower Manhattan and the extension campus in the Bronx. The website is responsive, dynamic and allows their students to access important information on classes and services. The site presents innovative sections for students to select their desired education options. Our creative team produced designs and layouts before programming the final site. A simple content management system was implemented and allows easy updates to the site. Print Campaign – Our team of skilled designers created, produced and printed a variety of full color brochures, sales sheets, and corporate identity materials. Including updating the logo and marketing materials. This full color campaign was effective in presenting powerful visuals that showed the students various selling points and education solutions they offered. Full color photographs, graphics and written messages positioned MCNY as a city wide education leader. Broadcast – The agencies skilled designers and videographers wrote and produced on-line videos that presented key class descriptions, courses and the unique attributes of the college surroundings and key personalities of the instructors. Social Media – Our social media division, ‘Cocoon’ produced and integrated a new media strategy into the overall marketing campaign for the college that included student interaction. The campaign included the integration of such social platforms as Facebook, Linkedin, Twitter and Utube solutions. Content Analytics – With a fully implemented integrated marketing and design strategy our agency needs to track and deliver performance statistics. The campaign success will be monitored and studied to deliver analytics that help us see what and how are solutions are performing. We initiated SEO and hosting services that monitor and deliver objective content analytics results that will help us fine tune our future campaigns.